We have come together to open up a discussion on the 'Unspoken Genocide' in SriLanka. First I would like to thank the organizers for opening up such a discussion for the first time in the country. They have put forth great effort to break the silence of this country on SriLankan ethnic crisis and the worst Genocide of our times. This effort by the student community raises question on our responsibilities. They have made the first move. We are to follow. It is indeed high time to break our silence and the silence of the country and discuss, decide and act upon the issue. The Permanent People's Tribunal on SriLanka held at Dublin has come with a report which clearly states that the SriLankan Government has committed war crimes and crimes against humanity in its bloody war against the Tamils of the country. Friends, how does that concern us? Or rather, I would ask, how is it more concerned to us, than the war crimes committed by the US in Afghanistan and Iraq? There are two important reasons. One, it is concerned to us, because what SriLanka has done to the Tamils there, is what India may do to suppress the nationalistic and socialistic struggles in India. SriLanka has presented a model genocide... a model which has successfully massacred hundreds of thousands of civilians without any witness. A war without witness is what SriLanka has presented before the world as a model. This model has now given strength to the rest of the oppressing governments of the world and shown ways of how t o oppress in a more brutal way without having to worry about international or national criticisms. This model can very well be executed by India in Kashmir or the Punjab or the North East or in the 'Red corridor'. Name it 'War against terror' or 'War for peace' and execute anything brutal. Nobody will question you. I say this because, SriLanka did not invade any other country or people. It launched the brutal attack on its own civilians... its own citizens, in the name of 'war for peace'. Yes peace in the form of graveyard. A clear act of Genocide. United Nations defines Genocide as the "The systematic and widespread extermination or attempted extermination of an entire national, racial, religious, or ethnic group." Genocide does not only mean killing. And the SriLankan Government did not only take the lives away. The Genocide against the Tamils in SriLanka did not start very recently. It has been systematically implemented in various forms from time to time. It is that systematic implementation which reached its peak in 2009. When dealing with war crimes, the international community is focusing only on a few of the issues, especially at the end of Eelam War 4, at Mullivaaykkaal in May 2009. But, there have been an ongoing record of grave breaches of the Geneva Conventions of 12 August 1949, for a long time in the island of Sri Lanka and the pattern of this long record has to be analysed by anyone investigating the War Crimes. My view is that the War Crimes, carried out by the Sri Lankan military with direct and indirect help from various actors of the international community, are part of a systematic programme and should also be investigated for the context of the patterns rather than singled-out events. It is also equally important to understand that a systematic and prolonged genocide doesn't take place without a deep mythology behind it. Like the hatred against the Jews in Europe throughout many years had resulted in the Holocaust, which led to the Genocide Convention, we also see clear evidences of a racial mythology originating from the Buddhist chronicle of Mahavamsa in the island of Sri Lanka. The only difference is that while the Jews have been migrants in Europe, the Tamils of SriLanka are the indigenous people of the island who have been living there from pre-historic times. The fact is that it is the Sinhalese who are settlers. While this historic fact is accepted in the Mahavamsa, the epic on the other hand preaches hatred against the Tamils. The Sinhala politicians have systematically promoted this Mahavamasa mindset for a long time and have turned the Sri Lankan state into a unitary Sinhala Buddhist state. The dangerous dimensions of the racism caused by the Mahavamsa mindset, which attacks the Tamil people who cherish secular values, should be objectively analysed by the investigators. It is very important to look at the racial motives behind the Sinhala state and its infrastructure, from the way how racism is being fed to the Sinhala children in its education system and to how the Sri Lankan military has been a racist oriented military. A structural analysis should be an important part of the investigations, if the investigation should become meaningful for all the victims of the past and the future. I only present my observations, which are symptoms of the underlying trend, to which we have been a witness for a long time. The Tamil people in North and East of the island of Sri Lanka always fled towards LTTE controlled areas since the Sri Lankan armed forces launched their military offensive violating the February 2002 Ceasefire Agreement. What took place in Vakarai of Batticaloa, Moothoor East of Trincomalee, Musali of Mannar and various settlements in the Vanni region are evidences of the crime how people were chased, uprooted and forced to flee, from place to place, in a systematic and planned way. Many people from Vanni who have sought refuge in Tamil Nadu tell us stories of having undergone displacements more than 20 times within the Vanni region alone, each time seeking safety within the LTTE controlled area. They could have fled towards Sri Lanka Army controlled areas, but they didn't. They viewed LTTE administered de-facto state of Tamil Eelam as their homeland and took a stand, to be there as it was clearly their political will. The term IDP, which stands for internally displaced persons, is a wrong one to be applied to most of the Tamils, who have gone through several displacements. They are not simply 'displaced' for a temporary period, but were constantly driven through waves of displacements in such a way they lose everything and end up finally without anything, totally uprooted. They are not IDPs but an Uprooted People. Bringing the war to the places of civilian population, against their will, is a crime against humanity. Attacks on civilian safety zones, resulting in the massacre of children and women and deliberate starvation resulting in malnutrition are clear signs of not only war crimes, but also ethnic cleansing and genocide, as these are acts of deliberate and systematic destruction of a racial, political, or cultural group, against its collective will. There have been systematic attacks on ambulances inside Vanni for a long time. There has been a systematic campaign of air-raid with massive attacks on civilian centres. All this has to be looked in a perspective of a long time pattern. For a long time, the Tamils in the South were living in constant fear. But, now the remaining Tamils in Vanni and other places have been incarcerated, stripped of every personal possession, and become subjugated. They are subjected to psychological genocide. The Sri Lankan military has taken over even their right to re-settle and re-construct their livelihood. The Sri Lankan military is carrying out the so-called development, to which Colombo is seeking funds from the international community. They are subjected to structural genocide. This "development" is being carried out with the agenda of settling Sinhalese in traditional Tamil lands. This act of terrible proportion is demographic genocide. This demographic genocide has been going on for decades. From the Sinhala Only policy, destruction of Jaffna Library and the attack on International Tamil Conference, there has been a continuous record of cultural genocide in the island. Tamils who reach Tamil Nadu report deliberate annihilation of cultural heritage. They tell stories of many Buddisht shrines being built all over the Tamil homeland. The names of the Tamil villages and roads are being changed to Sinhala. What is going on in several places along the coasts of Vanni now is cultural genocide combined with demographic genocide. Even before the armed conflict, there were systematic state-sponsored pogroms in 1956, 1958, 1961, 1974, 1977, 1977 and that of large genocidal proportions in 1983, which is remembered as the Black July by Tamils. There have been no investigations of international proportion on these crimes against humanity and genocide. If the world bodies had addressed the visible symptoms of these pogroms at an early stage, the Tamils would not have been forced into an armed resistance. The UN in its International Covenant on Civil and Political Rights 1966 says quite clearly in Article One that “All peoples have the right of self determination”. Most importantly Government of Sri Lanka is a party to this Covenant and hence is bound by its own treaty. Based on the UN’s definition of Self-determination, many nations were provided with the right of Self-determination. Very recently 2 nations, East Timor and Montenegro were provided the right of Self-Determination based on a referendum. In East Timor 74.85% of the people voted in favor of Self-Determination. In Montenegro, only 55% voted in favor of Self-Determination. Yet the UN recognized their right to Self-Determination. But the people of Tamil Eelam have been opting for Self-Determination from as early as 1977 and have been voting in favor of the same. In the 1977 elections, when the TULF contested the election with a single point manifesto, stating to achieve Self-Determination of Tamils through a separate Tamil Nation, out of the 19 seats 18 seats were won by them, which accounts to more than 90% people in favor of Self-Determination. In 1983, during the Local bodies election, the Liberation Tigers of Tamil Eelam called for the people to boycott the election, on the line of Self-Determination. At that period, LTTE was just one of the five militant movements fighting for Self-Determination, and the smallest. Even then the people accepted the call and 95% of them boycotted the election. 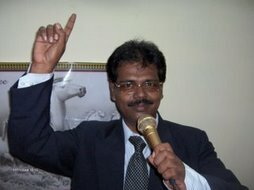 In 2004 Parliamentary elections, the Tamil National Alliance (TNA), comprising of 4 Tamil Political parties, viz., TELO, EPRLF, TULF and SLTC, contested the election stating that they accept the leadership of LTTE in the struggle of Self-Determination for Tamils in the form of separate Tamil Nation. TNA won 22 of the total 23 seats. Here again the result indicates that more than 90% voted in favor of Self-Determination. Not only in the areas under the control of LTTE, but also in Jaffna, which is under Government Control, 90.65% of votes were polled in favor of TNA. In 2005 Presidential Elections, LTTE called for boycott and more than 95% boycotted the election. In Jaffna, which was under Government Control the polling was only 1.21%. Hence, not once, but in 4 elections, the Tamil people have expressed their consent for Self-Determination. That too every time it was more than 90%. When UN can recognize East Timor with 74.85% and Montenegro with just 55% why can’t it recognize Tamil Eelam with more than 90% for 4 times? While the Tamils have been continuously expressing their will for Self-Determination through all possible ways, the Sinhalese was using various political tactics to undermine the Tamils. Not a single pact entered into by Sinhalese was respected by them. Not only the pacts entered into with Tamil Leaders like the Dudley-Chelva and Chelva-Banda pacts, also the pacts entered into with another country or with the mediation of another country were broken by the Sinhala Governments. In 1987, India represented by its Prime Minister Rajiv Gandhi, entered into an agreement with SriLanka represented by its President Jayawardane. This agreement had various clauses which included merging the northern and eastern provinces and withdrawal of military forces from educational institutions and places of worship. The LTTE respecting the agreement, surrendered its arms. But on the Sinhalese side, the military was not withdrawn. LTTE commander Dileepan undertook fast unto death stressing the Indian Government to implement the clauses of the agreement. But India let Dileepan die. Yes friends.. coming from a militant organization, Dileepan did not fight with India with arms. He followed the path of the Father of Indian Nation, Gandhi, and undertook fast unto death. But India did not respect his struggle. Gandhi’s country let a young man die on fasting. After 12 days of fasting without even a single drop of water, Dileepan gave up his last breath. Recently, the Sinhalese made the merger of Northern and Eastern Provinces unlawful through a court verdict. The only clause remaining in the Indo-SriLankan agreement was also thrashed. On February 22 2002, SriLanka entered into an agreement with LTTE in the presence of Norway in Oslo. The main clauses of the agreement were to withdraw the military from social buildings. The Military had occupied 156 school buildings in Tamil areas. Also, in 144 schools, stating that the buildings were un safe, the military had restrained the schools from functioning in the buildings and hence those schools were functioning under the trees. Further military had occupied places of worship like churches and Hindu temples. Added to that they had occupied houses and residential places too. The Oslo agreement was that the military be withdrawn from Schools and places of worship in 160 days, from houses in 30 days and from other residential areas in 60 days. Further the agreement was that Tamils are to be allowed fishing in the sea in 90 days. But none of these were done. It is this level of respect does the Sinhalese give to international community and international laws. It is this same Sinhalese Government which now says that it maintains the camps with international standards. The Sinhalese Government has always been unruly, uncontrolled by any of the International standards, rules and regulations. Now with more than 3 Lakh people detained in concentration camps with their movements arrested, without proper food, education and other basic needs, the SriLankan Government is planning to produce a new generation of Tamils, without any capability, without the will to freedom, without any progressive thinking, without the fighting spirit, with their minds totally occupied on worries about their day to day life. As Dublin Tribunal's report rightly puts it, is this not a crime against humanity? Is it not essential to prosecute SriLanka on these charges under International law? I feel this as highly essential for the future of humanity. Yes my dear friends.. the world has come to such a state that there is urgency for each one of us to join hands to save humanity. What we saw in Afghanistan, what we saw in Iraq has now come very close to us. We could sense it just beneath our feet. My dear friends.. it will not be too long for us to experience it ourselves. I am not exaggerating. It is a fact. In Afghanistan and Iraq it was mighty US which executed the crime against humanity. But in this tiny country called SriLanka, it wasn’t any big power from outside. Neither is SriLanka a powerful nation politically, geographically or economically. But such a weak country like SriLanka, could very openly execute genocide on its own people, what bigger danger could befall on humanity? The Second reason on why this brutality of SriLanka is more concerned to us as 'Indians', is because, our hands are soaked in that blood. It's our tax that went as arms and ammunition to commit those war crimes. It is with our money and in our soil, that those SriLankan military officials who committed the war crimes were given training. One could say, how can India be responsible just because it sold arms and provided training? You may add up saying that how can India control the affairs of another country. This was what the Indian high commands were saying all through. Even the Dublin report, which talks about the role of Western countries hasn't said anything about India. I want to take you back in history to find an answer for this question. In 1983, there was a dreadful pogrom against the Tamils in the SriLankan Capital Colombo. Thousands of Tamil civilians were killed. Lakhs of them fled to the Northern and Eastern part of SriLanka which is their traditional homeland. The pogrom was spreading all over the country. It was at this stage that the then Indian Prime Minister Indira Gandhi said in her address to the nation on August 15, 1983, that India will not keep quiet if such atrocities against Tamils would continue. It was after this statement of the Indian Prime Minister that the state sponsored pogroms came to an end. This is just an example of how India can take control of the situation in another country. Today Indian Government is biased and prejudiced towards Tamils of SriLanka. The media with all its vigor stands by the Indian Government in its bias and prejudice. And the people of India trust the media and are influenced by the media to take a prejudiced stand. I can explain on how media stood on the wrong side. From the day the war broke up, Tamils in SriLanka were uprooted. They had to restrict themselves to a limited space. In the course of the war, this limited space shrunk and became even more limited. From January, reports started pouring in on heavy casualties. Hundreds of thousands of people were clinging to each other in a very small area. And SriLankan Army, Air force and Navy were using heavy weapons, artilleries, cluster bombs, phosphorus bombs and other chemical weapons and what not, on the places where Tamils were dense. Dublin report confirms the use of these banned weapons and clearly states that the targets were the Civilian population. Dublin report also says that hospitals, schools and other civilian building were bombed. People were dying in hundreds everyday. As per the Dublin report which in turn quotes the internal documents of the UN, almost 217 people were dying everyday. None of these appeared in the Indian media. There wasn't even a slightest quote. But on May 19th.. Indian media was completely filled with SriLankan news. The news that LTTE leader Prabhakaran was dead. Some media even projected as if the whole war was to kill him and now SriLankan Government has won. The Indian media was literally rejoicing on the victory of the SriLankan Government. Even while publishing/telecasting this news, Indian media didn't care to mention about the death of hundreds of thousands of the Tamil civilians. And post-war, newspapers like Hindu write that Tamils are now kept in golden cages. According to them, the IDP camps, which are actually concentration camps, are paradise on earth. And for the rest of the media, only thing that drew their attention in the whole episode was the news of Prabhakaran's death. Is this only because of lack of information? Surely not! It's something else. 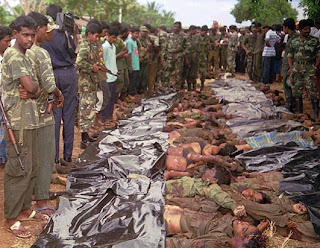 The media not only closed its eyes towards the war in SriLanka, but also when Indians were killed by the SriLankan Navy. Yes. From early 1980s, more than 300 TamilNadu fishermen were killed by the SriLankan Navy. Thousands have been abducted and tortured by them. The whereabouts of many such abducted fishermen are not known for years. Their families are in dismay as to whether their loved ones are alive or not. This is continuing even today, though the SriLankan Government has declared that the so-called ‘war against terrorism’ is over. Aren’t the TamilNadu fishermen Indians? Isn’t the Indian Government with its Navy responsible for their safety? Aren’t the Indian media and Indian politicians concerned about a foreign navy crossing our borders and killing our people? If the Indian fishermen are abducted or arrested by the Pakistan Navy, it becomes a national issue. But even if the SriLankan Navy kills Indian fishermen its nothing. Its still a mystery why this has never been an issue. Legally speaking, the TamilNadu Government and the Indian Government have all the legal rights to sue the SriLankan Navy under war crimes for its brutality against TamilNadu fishermen. As an added evidence on how the Indian Government is prejudiced and biased with regards to SriLankan Tamils I would like to bring to your notice the plight of the SriLankan refugees in India, concentrated in Tamil Nadu. There has been flow of refugees from SriLanka from time to time. During early and the mid 80s the flow was very high. Those people who came here then are still in India. Most of them live in the Government sponsored refugee camps located in various parts of the state. Few others live outside the camps along with the local people. Apart from these two categories there is one another, which is the worst of all. I will come to that later. In 2007, a team of law college students did a comparative study of the SriLankan Refugee camps with that of Tibetian refugee camps. The result once again exhibited how biased the governments are when it comes to SriLankan Tamils. The SriLankan Refugee camps in India are no less than the IDP camps in SriLanka. Very poor living conditions with no proper sanitary systems or medical aid. We can even keep that aside. But the restrictions imposed on them are something which raises doubt on whether we are in a democratic nation or not. They are not allowed to possess mobile phones. No free movement outside the camps. There is no proper medical aid provided inside the camps. Hence if anybody is sick they need to go outside the camp to get treatment. But even for this they need to obtain permission. They are given very meager amount as daily compensation. While the Tibetian refugees are given around Rs. 5000 per family for a month, the SriLankan refugees are given an incomparable amount. The man of the house with Rs. 144, lady of the house with Rs. 100, other adult members with Rs. 90 and children with Rs. 25. Hence a family with a man, wife, one elderly person and 2 children will get around Rs. 384 per month. Can you imagine? 5 people living with Rs. 384 per month. It is good to know that the Tibetian refugees are treated in a better way. Our question is just why are the SriLankan refugees not treated in the similar manner. The SriLankan refugees, unable to live with the compensation provided, try to find jobs for daily wages. But even for that, they ought to get police permission and are sent outside the camp for such jobs only for 3 days in a week. 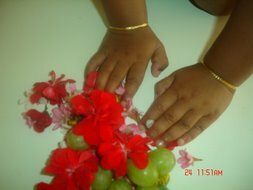 SriLankan Tamils, by nature, give more importance to education. But that has become the major crisis. They need to study in the government schools in the nearby locality. For higher education, till 2003, special reservation was provided for the refugees. But now it has been revoked. Hence professional education is just a dream. They cannot enroll as advocates. They cannot buy land or vehicles. Land at least is understandable. But vehicles? Even those who would like to earn their living as taxi drivers cannot do that since they cannot buy a vehicle. Not even two-wheelers. They have been kept in these living conditions for more than 25 years. And it is not all. The worst is yet to come. As I mentioned earlier, there is one another category called 'Special camps'. As and when the refugees arrive by sea at Rameshwaram, the coastal town closer in sea route to SriLanka, men and women are separated and interrogated. Of that, youth are once again separated and taken away by the Tamil Nadu Police intelligent wing, the 'Q' branch police. The Q branch police say that the youth are separated to find if they are militarily trained. It is at the will and wish of the Q branch to decide on whom to be freed to the camps and whom to retain. If any person resists, or even shows a slightest gesture of resistance, then the family has to forget that person. They are taken away for more intensive interrogation and then they are branded as militants and are kept in 'Special camps'. Apart from those directly from the refugee camps, others who are arrested outside the camps on various charges, even if they have a valid passport and visa, they are detained in these Special Camps. These 'Special Camps' were initially constituted in 1990, in Vellore. The Tippu Mahal and the Hyder Mahal were used for this purpose. Of the two, one was told to be for militants and the other for supporters, who were not directly members of the movements. These supporters were detained with their family. As such there were 150 detainees in the militant camp and 200 in the supporter's camp. On 1993 May 14, an additional camp was constituted in Chengalpet, which is around 50Kms from Chennai. Actually it was the Chengalpet Sub-jail which was converted into the camp. Only militants were detained in this camp. Friends, these 'Special camps' are nothing but illegal prisons under the control of the Tamil Nadu Intelligence. It doesn't come under the Prison department or the local governing authorities. It is completely controlled by the Q branch police. As soon as one enters the 'Special camp', all his documents including his passport, educational certificates etc are taken away from them. This is the lock that the Q branch puts on them. Hence, in order to get back their documents safely the people have to abide by whatever the Q branch police say. False cases are implicated on them. But no trials are conducted. Even if they are not remanded or convicted by the court, the Q branch says that till the case is over they ought to remain in the Special camps. Even if the court grants bail to them, they are brought directly from the prison to these Special camps. Charge sheets are never filed in the cases implicated on them. This means that they have no idea to finish the case. The worst is, even those who are released by the court, are not sent out but kept in these Special camps. In Rajiv Gandhi murder case, of the 19 acquitted by the Supreme Court, 9 were SriLankan citizens. But from the very gates of the prisons, the Q branch took custody of them and took them to the Special camps. This was not under any legal grounds. Only after they agreed to go back to SriLanka or any relative of them made arrangements to take them to a foreign country, they were released from the Special camps, taken directly to the airport and sent out. Imagine, how many will have the opportunity to go abroad. And they have come from SriLanka to India only because their lives are at risk in SriLanka. Then how can they go back? Is it humane to send them back? We have filed cases against these illegal prisons. But the cases are still pending in the courts. The inmates and many human rights and social organizations have been continuously fighting for the closure of these illegal prisons. The inmates of the Chengalpet camp undertook fasting requesting, not for their release, but to conduct trails and finish the cases pending on them quickly. But they were brutally attacked by the police. All their belongings were broken. Many were badly hurt. The human rights organizations, students and various other politically and socially concerned organizations like ours, took up the issue and agitated in support of the detainees. Even after all this, the Government in December 2008, constituted yet another camp in Poonamallee. The specially constructed prison to detain the accused of the Rajiv Gandhi murder case was used for this purpose. This Special prison was termed as a high security prison and after those accused in Rajiv Gandhi case were moved to other prisons, the Muslim youth arrested in the Coimbatore Bomb blast case and in various cases all over the state were detained there. Now this prison is used as a Special Camp. By the end of 2008, there were 97 detainees altogether. After continuous agitations and hunger strikes, some were released and now there are 34 detainees. Of these 34, 5 have no cases or charges against them. They were released on all cases one and a half years back. But still they are detained. 10 of them are detained for more than 2 years since charge sheet has not yet been filed on them and the case is pending in the court without trial. 4 of them are severely sick but are detained without any proper treatment. Apart from this, there are a number of Indian Tamils who are implicated on various cases on the charge that they helped LTTE in various ways. As you may all remember, in 2002, POTA was used in Tamil Nadu to arrest people who lent verbal support to LTTE. Similar cases still prevail, though not under POTA, but under various other sections of CRPC and the Unlawful Activities Prevention Act. And these cases too are dragged without trial. There are number of people in prisons for years together as under-trial prisoners. And many others are walking to courts for more than a decade. I am standing example for them. I was arrested twice in NSA and once in TADA. The TADA case was framed in May 1994. I was released in bail in January 1995. From then on for the past 15 years I have been traveling once in a month to the court which is more than 200 kms away from my place, only to get the case adjourned. The case is pending since the argument was not heard for about 7 years. More than 5 judges have changed. And each time a new judge comes in everything is started afresh. One other person Mr. Rajan who was also arrested in this case was not given bail for 9 years. The tragedy is that even if he is convicted on the charges against him, the maximum punishment could be only 5 years. This shows how the Tamil Nadu State Government and the Indian Government are highly prejudiced against the ethnic problem in SriLanka. They did not approach the issue with concern. Rather they used it to intimidate the Human Rights and social activists. Hence it is clear that the Indian Government is with the SriLankan Government in its Genocide against Tamils. Friends, I come from Tamil Nadu. We the people of Tamil Nadu are more emotionally bound with the issue, not only because we share an ethnic relationship with the Tamils of SriLanka. But mainly because we have more close-up shots of the issue. In the past 30+ years, each family in Tamil Nadu has an acquaintance with at least one or more SriLankan Tamil. We have heard their plight, their life, their history and their struggle in their own voice. We know their pain not from the media but through personal conversations. We understand their struggle for a life with self-esteem through self-determination for their homeland. And we are completely convinced that theirs is a struggle for freedom and not terrorism. It is because of this that, all sectors of people in Tamil Nadu raised their voice to stop the war. Political parties, Social organizations, laborers, trans-gender community, physically challenged, Film industry, Students, advocates, IT professionals.. not a single sector was staying away. Each one of them showed their concern and protest in whatever mean was possible for them. A resolution was passed in the State Assembly. But … none of these appeared in the National Media. And other than us, nobody else from any part of the country uttered a word except for a few but strong words of concern from the intelligentsia. This hurt us a lot my friends. Leave alone the media. Leave alone the Government and the political parties. But the social movements, human rights organizations and activists and the intelligentsia of the country.. their silence has what hurt us a lot. Our voices were not heard. And we lost more than 1 Lakh people in a few months. And that is why I said, our hands are soaked in blood. We are still not out of the shock. We are still mourning. And ... the Bollywood is getting ready to conduct its biggest event of the year in Colombo. I really do not understand this psychology. The tribals in Chattisgarh are killed by the army. The women in Manipur are raped by the Indian army. The youth in Kashmir disappear. But the country continues to lead its life with rejoice. I do not expect them to mourn with us. But not even a single word is uttered in concern. Where do we lag in making the people in other parts of the country understand our emotion. Our feelings. Our concern. While thinking of what happened to our fellow Tamils in SriLanka, sometimes we feel that the whole country has betrayed us. All the time we feel guilty that even though we are part of such a big and powerful nation, we weren't able to save our fellow people. Not only that the Government we elected did not heed to our feelings and stop the war.. but on the contrary.. stood on the opposite side and helped the SriLankan Government to kill those people for whom we were crying aloud. We were totally helpless. How can we ever face them anymore? One old woman who was in the war zone till the last day of the war, then in the camps and has now come to India.. I happened to meet her. She has lost her son. She has experienced things that we could not even imagine or understand. She has walked over dead bodies to save her life. At this old age.. she had to literally run. Till the day I met her, she hadn't come out of the shock. Of course we cannot expect her to come out so soon. She explained me all her experiences with no tear in her eyes. No shake in her voice. Even when she spoke about her son, she said it in a plain tone. But my friends, you know when she broke down? 'We were waiting for India to come to our rescue. Our only hope was with India. But India too betrayed us' and with that she broke down to tears. Imagine how guilty I would have felt sitting before her. This guilt is what is killing us today. We want to do something. At least for those people remaining alive. Not just for their livelihood, but for their freedom, their dignity and their self-esteem. The Dublin report has come as a beacon in the darkness, which befell on us in May 2009. I use this opportunity to thank the Permanent Peoples Tribunal (PPT) that found the Sri Lankan government as guilty of war crimes, crimes against humanity and that the International Community, particularly the UK and USA, share responsibility for the breakdown of the peace process and that the charge of genocide requires further investigation. While also thanking the Irish Forum for Peace in SriLanka which hosted the Tribunal, we look upon with gratitude, Justice VR Krishnaiyer, Justice Rajindar Sachar, Ms. Arundati Roy who have come forward and contributed in support of the Dublin Tribunal against the war crimes committed by the SriLankan Government. This gives us great hopes for the future. We are now strengthened with your support. With that in mind, I would like to put forth the following requests to the esteemed guests who have gathered here with concern. One, the International Community has a responsibility to address the war crimes, crimes against humanity and the investigation on genocide in correct context, not failing in its duty in prevailing upon the Sri Lankan state for all its war crimes, crimes against humanity and genocide, and ensuring that the justice for these continuous crimes is translated into a meaningful political solution, satisfying the aspirations of the Eelam Tamil Nation. Secondly, is regarding the IDP camps in SriLanka. The Indian Government said in June that the SriLankan Government had given assurance that it will re-settle all the people in the IDP camps within 6 months. But it almost a year and the IDP camps still exists. The people in the initial IDP camps are separated into groups and moved to different camps. They are not re-settled in their native places. It is reported that Sinhalese settlements are done in full swing in the Tamils' traditional home land. I request you to urge the Indian Government and in turn the SriLankan Government to ensure that all Tamils are re-settled in their own home lands. Number three, the Human Rights watch in its report released on February 1 2010 says that more than 11,000 people are detained in SriLanka as LTTE suspects. The government contends that the 11,000 detainees are former fighters or supporters of the LTTE. The 30 page report of the Human Rights Watch states right in its title as 'The uncertain fate of LTTE suspects'. As such, the Government refuses to release details on where these detainees are kept and in what condition they are. This has left their families in anguish and agony. Hence, the SriLankan Government should be urged to release details on the whereabouts of these detainees and allow their family members to meet them. Further emphasis should be made to treat these detainees as prisoners of war, thus securing them under the International laws on Prisoners of war. 4. As regards to the situation prevailing in Tamil Nadu as to the conditions of the SriLankan Tamil refugees, the Tamil Nadu Government should be urged to provide better living conditions for the refugees. While the Special Camps are to be closed permanently, the Normal camps are to be inspected periodically by a committee of independent individuals like doctors, human rights activists, lawyers and such renowned citizens. 5. The Indian Government or the Tamil Nadu Government should execute its legal rights and sue the SriLankan Navy for entering the Indian borders in an unauthorized manner and killing the Tamil Nadu fishermen. As a final request, once again I request each and every one of you to join hands to save humanity from State terrorisms.